Continuing our dip series…did you know it was a series? Well, I didn’t either until this moment. This series is an attempt to bring you the best dips to make for the current “dip season”. You did know there was a dip season…it begins when football season commences until Superbowl…this also incorporates all the holidays in between. Being a child of the seventies, when dips were not only “hot” they were also hot, as in warm, is when I fell in love with dip. Apparently I’m not the only one who thinks dips are cool, in Gourmet Magazine’s last issue (insert crying here), their Last Touch page was all about the dip rage in the seventies where they included four recipes, this being one of them. And yes, I will be trying all of them. Now this dip is not your typical creamy based spread. It’s a bit classier and requires a fork to scoop some on to your cracker. That does make it classier right? And you must love clams to enjoy this dip. I do and so does my family, especially my nine year old, which is very interesting to me. Anyway, loved this dip and all its garlicky goodness. I will say this would also be spectacular thrown over some pasta for a very quick dinner, in fact it would be delicious. If anyone tries that, let me know how it came out. 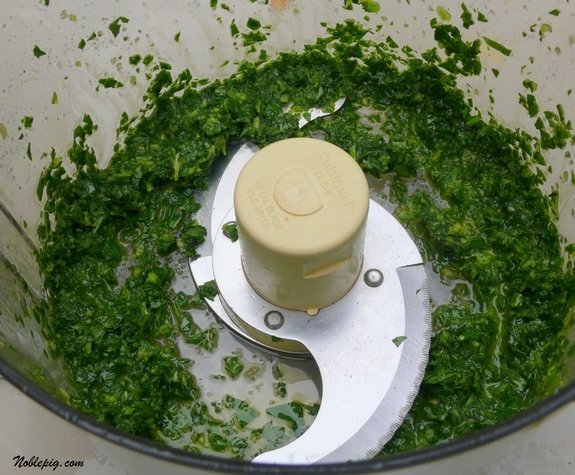 Puree parsley with bread crumbs and 1/4 cup oil in a food processor. Set aside. 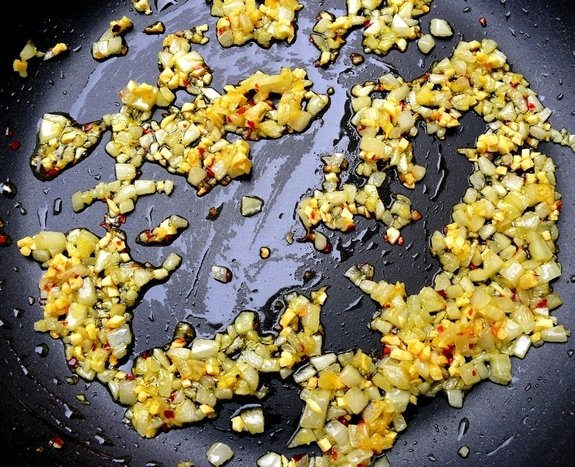 Cook onion, garlic and red pepper flakes in remaining 2 Tablespoons oil in a medium skillet over medium heat, stirring, until pale golden, about 5 minutes. Add wine and clam juice and boil, stirring, until slightly reduced, 1 to 2 minutes. 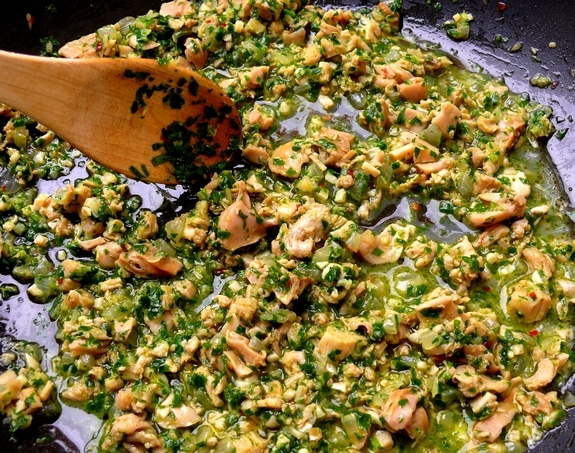 Stir in clams and cook until heated through, then stir in parsley puree. Remove from heat and season with lemon juice and salt. Serve with your favorite crackers or I’m not kidding about throwing this over some pasta, I think it would be great. The dips are getting better & better cathy, and prettier & prettier too. Oooooh yes, add classier to that! It’s a lovely one! This is a welcome change from your regular creamy dip(not that I mind those). I love the chunkiness of this dip!!! Pass me the crackers and breads. I am soooo trying this with pasta! I love that first picture, the greens are so pretty! Love the whole “dip series”! Wow, I bet this would be wonderful over pasta. I like this version without sour cream. Its on my dip list for the holiday. Oh, this is just gorgeous & has all my favorite ingredients! I’m digging this dip series for sure. 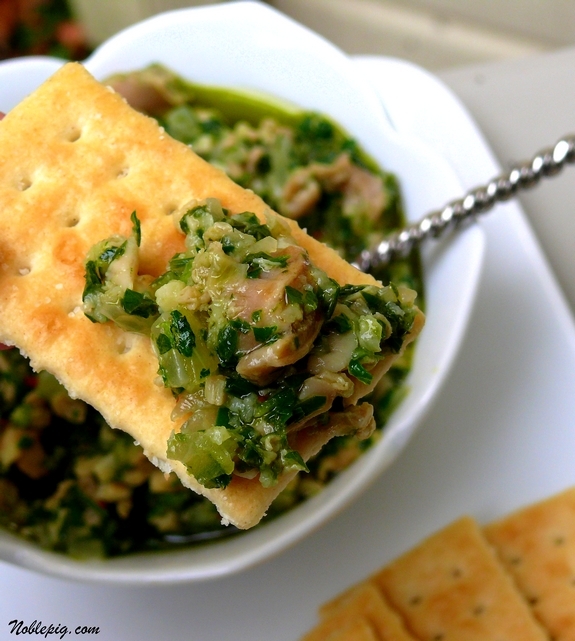 I wish just ONE person in my house liked clams because this would be such a great holiday dip or lovely over pasta for a holiday luncheon. We love clams at our house too, looks like an elegant dip. That really does look like it would be fabu over pasta! YUM! Do you know as a kid (in the 70s, when it was cool!) I hated dips. I hated sour-cream based onion dips and ranch dressing and all manners of creamy or cheese sauces on my finger food. I seem to have gotten over that pretty well. As far as I’m concerned veggies and crackers and chips only exist to be placed in something dippable. Sounds awesome! I would love to try it on crackers or with pasta! Whew! Thank goodness your photos are back! Yesterday I came by to see your post and couldn’t see any photos on the 1st two or three posts. Don’t you hate glitches! This dip does look amazing. I can just about taste it if I close my eyes. Yum! Cathy, my list of “must try” recipes is growing longer and longer thanks to you. Bookmarked! We do not eat a lot of dips, so I will try this one on pasta and let you know the results. I am also dying to try the canned clams, which I have not ever used before. Living on the coast, we always use fresh. Canned would be great for preparing meals in the motorhome, too. Keep up the good work on the dip series. They all look incredible. I’ll be making one of your dips for our Halloween party, I just can’t decide which one. Honestly, I could live on chips and dip and cheese and crackers! I’m lovin’ your series! Wow this looks amazing and you’re right – it is classier! I’ll be whipping some of this up using some clams we caught during our July on the Oregon Coast. Imagine bringing home a cooler full of clams and Tillamook ice cream on dry ice! Such homers! I love clams in all their many forms and clam dip? Well, now that’s on the menu of my next dinner party. I just entered in on this dip series and I think I’m already hooked and ready to go back in time and see what other delights you’ve written about. agreed but add some cream to it for the pasta. Love clams, my favorite clam dip is 2 pkgs softened cream cheese with 2 cans chopped clams and some of the juice, about a half can, a Tbsp or 2 of very finely minced onion, squeeze of fresh lemon, and a liberal amount of Worcestershire sauce. Mix it up or put it in the blender, add as much clam juice as you can without making it runny. Then get the salty, fattening potato chips out and PIG OUT!!!! Even better the next day…if there is any left. Except for the bread crumbs that is the list of ingrediants in my wife’s white clam sauce. she probably uses more garlic – we have no vampires here. I KNOW you are a wonderful cook, but I have to pass on this. Those clams scare me a little, although I love fried clam strips. LOL! It just something about being able to see them in the dip! I know, I know, sad isn’t it? Anything with clams is good in my book. And why wouldn’t that be just perfect over pasta? I love it. White clam sauce is our favorite “go to” dish for a quick weeknight meal. But, I never thought to thicken it up and throw it on crackers. Great idea. Mmm, this looks so delicious! Ok, I’ve never made clam sauce, but that’s why I come to this website – for ideas on great recipies. This is another one I’m adding to the list! Thanks! Love me some clams, this is elegant! Omg, that looks so good! I did NOT know about dip season and am so glad you keep us informed~ all the more reason to keep up on your excellent blog. I have just begun filing and assembling the recipes we have been trying ( and liking) this year and decided to add a ‘DIP’ section, so it is fortuitous you decided to start a dip series! Thanks. A winner in my book, I can’t ever get enough clams! I posted your boys’ coconut cake from last year on my blog…came out delish. I love this clam dip recipe because it doesn’t have all that gross melted cheese on top! This looks so delicious. I wonder if I could make it in place of my dad’s favorite clam dip this Christmas- he may notice though. Can always make both! 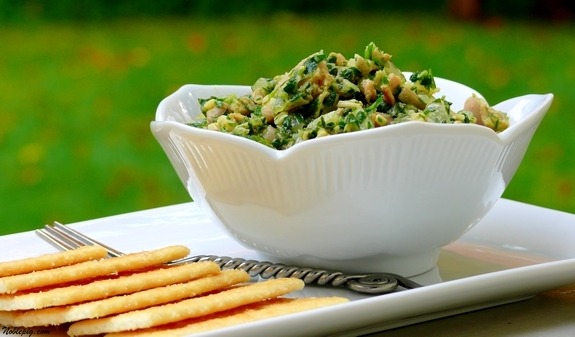 Clam dip is one of my all time favorites and this one looks PDG. This is a super dip! So fresh looking and it doesn’t have all that sour cream or mayo in it. Just made this- love it! I just caught up with you, you stay so busy with new recipes. And your photos still put me to shame. I was thinking this might be good on a baked potato. Especially if you are pregnant. I love white clam sauce, clam chowder, etc..
Oh my, that look pretty delicious. Ok, this dip series is great! I’m going to have to try every one of them. This would definitely be a delicious pasta sauce too. Hmmm, I’m trying to imagine it. I’m just not sure. It’s worth a try though. I took 1 st credit loans when I was 25 and this helped my business very much. Nevertheless, I need the college loan over again. We live on Long Island and love our clams, this is one of our favorite Sunday afternoon football snacks. I think next time I will serve with some thin slices of a baguette loaf.